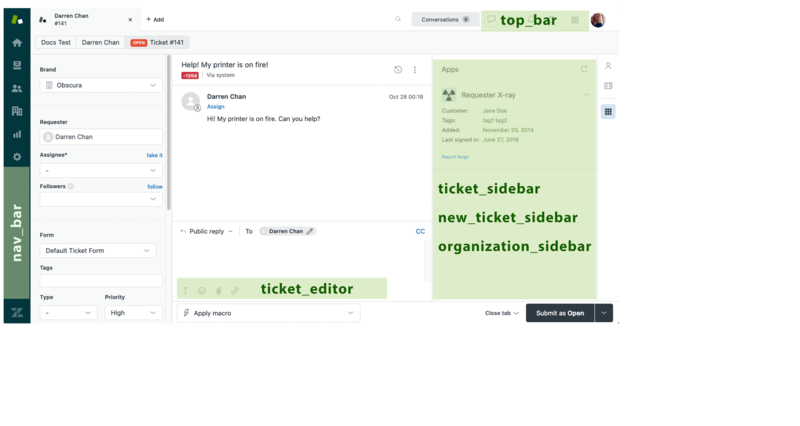 This document lists the events and objects, as well as any additional properties and actions, that you can use to build apps in Zendesk Support. This API is supplemented by the Core Apps API available to all Zendesk apps. If you're just getting started, see Building your first Support app. See the following location docs for the events, properties, and actions you can use in each location. To specify the location for your app, see Setting the app location. If you specify nav_bar, top_bar, or ticket_editor, the app appears as an icon in the location. Clicking the icon opens the app. Use the ZAF client in your app to listen for events, invoke actions, and access properties in each location.